Bleached coral on Lizard Island in the Great Barrier Reef in 2016. Photo: Underwater Earth/XL Catlin Seaview . Repetitive, severe marine heat waves are disrupting the Great Barrier Reef's ability to regrow with a similar abundance and mix of species as before, a new study warns. The paper, published in Nature Wednesday, depicts a vast, complex reef ecosystem that is on the verge of "ecological collapse." Why it matters: The Great Barrier Reef is the word's largest coral reef ecosystem, spanning 1,400 miles from north to south off the eastern coast of Australia. The reef is a haven for biodiversity and a major driver of tourism for Australia. The new results add to a series of grim findings about just how susceptible this reef community, long viewed as too big to fail, is to warming ocean waters. What they did: For the study, researchers in Hawaii and Australia examined how corals reproduce, or spawn, from one year to the next, by taking in situ measurements out on the Great Barrier Reef. Researchers compared spawning behavior in years prior to the marine heat waves that struck two-thirds of the reef in 2016 and 2017 against what happened immediately following the heat waves, also referred to as coral bleaching events for their tendency to turn corals a ghostly white as heat stress causes organisms to kick out symbiotic algae that gives corals their vibrant colors. What they found: By comparing coral spawning behavior in years without marine heat waves with what followed the devastating marine events of 2016 and 2017, the study found that such heat events compromise the reef's capacity to recover by causing a sharp plunge in coral reproduction rates. By killing adult corals, the heat waves slashed the rate of reproduction and the balance between coral species. According to the study, the number of new corals settling on the Great Barrier Reef declined by 89% following the assault on adult corals in 2016 and 2017. One species, Acropora, which establishes branching and table coral, declined by 93% compared to prior, non-heat wave years. What they're saying: There are more reasons for pessimism about the reef's future than optimism, scientists tell Axios, but all is not lost, at least not yet. 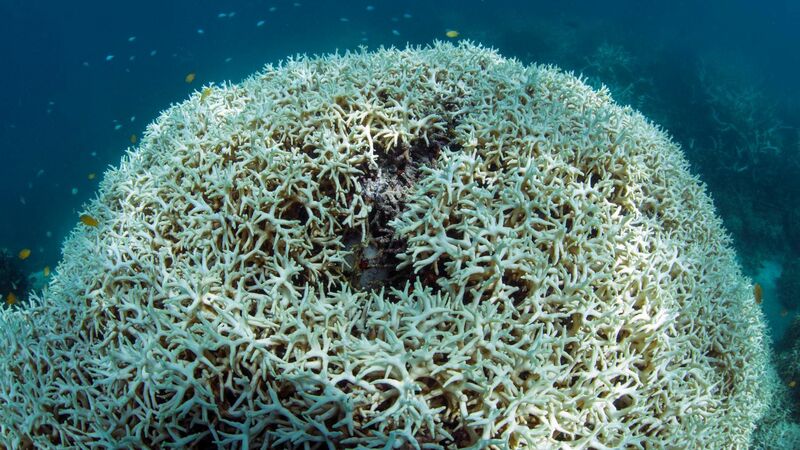 The increased frequency of bleaching events means that more corals will die before they can recover. "One more large scale bleaching event in the next few years and it could be curtains" for many parts of the Great Barrier Reef, study co-author Andrew Baird, of James Cook University in Australia, tells Axios via email. But the new study is just one snapshot of the reef's damage right after a massive shock. "The drop in coral recruitment is what we would expect after such severe bleaching events that result in high mortality of adult reproductive corals," says Sarah Lester, who studies corals at Florida State University. “I think extrapolating that to say that we could understand how these systems are going to respond or compensate potentially over the longer term, that’s a bit harder, that still would remain to be observed because we’re still trying to extract these lessons from these sort of life after death moments,” says Kim Cobb, a coral expert at Georgia Tech. But, but, but: However, the severe bleaching events mean that the surviving corals were able to withstand the extreme heat, and that they may prove more resilient to future events as well. Madhavi Colton, program director with the nonprofit Coral Reef Alliance, says she''s interested in seeing what happens with coral recruitment (the term that describes the process by which coral larvae attach themselves to existing coral) beyond just a single year following the bleaching event. “I would be interested in seeing if this trend holds up, then we should be more alarmed than we are with one very bad year,” she tells Axios. Be smart: Colton says in looking at these results, one could focus on the high percentage of corals that died, which previous studies have pegged at about75% of all the corals in the northern two-thirds of the reef. Or, as she put it, "Oh my gosh, 25% of the corals survived! They made it through that! And that’s where the future lies," Colton says. The bottom line: According to Cobb, the future of the world's reef ecosystems will look nothing like what we've known in the recent past. “It’s worth remembering that we kind of think about will they ever get back to where they were before these events happened? Probably not," she says.